At first glance, you might think that Nova Scotia is an island, separate from the North American mainland. That’s only partially true — the northern end of the province (Cape Breton) is an island, but the rest of Nova Scotia remains attached to the continent thanks to a narrow, flat strip of land. If you’re driving to Nova Scotia, this is where you’ll arrive. 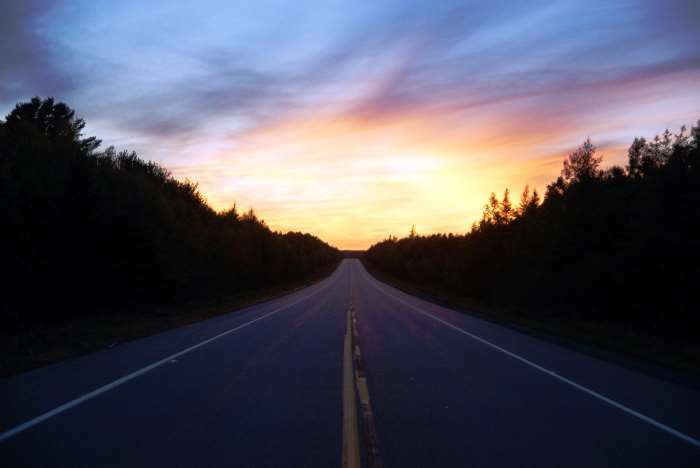 Aside from just a couple of minor roads, there’s just one highway connecting Nova Scotia and New Brunswick: The Trans Canada Highway, Route 2 on the New Brunswick side and 104 on the Nova Scotia side. A bridge marks the provincial line, with the flags of each province flying on either side. You can thank the Isthmus of Chignecto for making it easy to drive from New Brunswick into Nova Scotia. This low-lying strip of earth is mostly marshland and tidal rivers, and measures just 24 kilometers (or about 15 miles) wide. If sea levels rose just 40 feet, Nova Scotia would officially become an island. As you drive across the isthmus, you’ll see some power-generating windmills, and the beautiful Nova Scotia welcome center. It’s worth a stop here for some selfies with the big welcome sign, as well as a bathroom break. I made it into Nova Scotia just before sunset, and since I was spending the night in Halifax (about 200 kilometers, or two hours away), I didn’t have much time to spare. … a very big blueberry. This is not the world’s largest blueberry — or at least, it doesn’t try to claim that title. There’s a much bigger blueberry in Maine, but it’s more of a half-blueberry — really just a domed building painted blue. If somebody wanted to pick a blueberry fight, I think Oxford’s version might win. 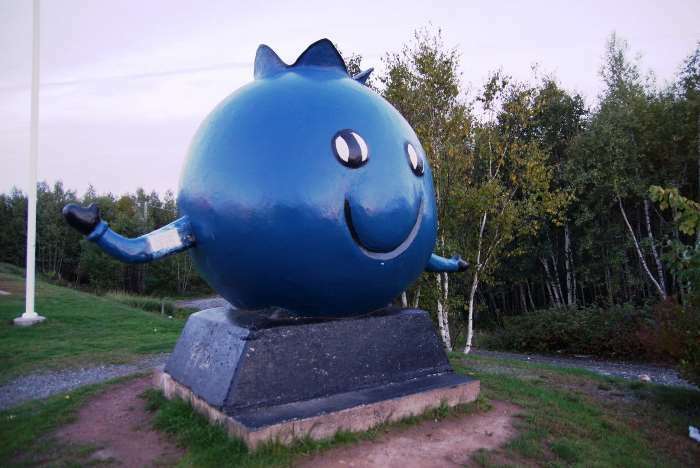 There’s a big blueberry here, because Oxford is the wild blueberry capitol of Canada. Nova Scotia produces 40 million pounds of blueberries a year, shipping them around the world. And in case there’s a quiz later, please also note that the wild blueberry is Nova Scotia’s official berry. I hate it when there’s a brilliant sunset playing out, and I can’t find a good place to take a picture of it. The sun had dropped below the horizon around the time that I got off of Highway 104 and onto Trunk Route 4 (an alternative to the toll route over Cobequid Pass — at this point I didn’t have any Canadian cash yet). In my rear-view mirror, the glowing sky lined up perfectly with the mostly empty road, so I pulled over, stood in the middle of the highway, and took a few pictures. If there’s a more scenic spot along Trunk 4, I couldn’t find it. And then, I drove on to Halifax in the dark. The drive from New Brunswick into Nova Scotia isn’t especially scenic, but maybe you can pick up some blueberries along the way. Or at least pose with the big blueberry at Oxford.